Over the years there have been tons of sports games released on the App Store, and as time goes on, each release seems to get better and better as developers refine their offerings. First Touch Soccer [99¢] follows this trend beautifully, with some great AI, awesome graphics, fantastic controls, and even online multiplayer. 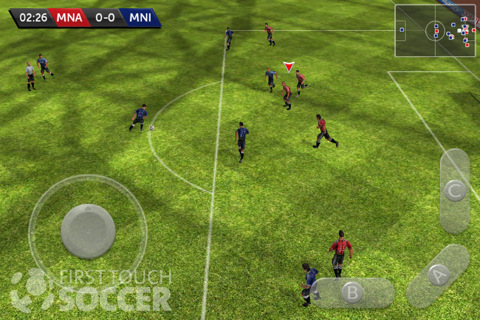 Released by X2 Games, First Touch Soccer is a continuation of the X2 Soccer series released in 2009 and 2010, which we had a great time with in previous years. One of my favorite things about First Touch Soccer is how smooth the controls are. X2 Games has really refined their virtual controls, and every function in the game is easily accomplished using a set of three buttons and a virtual joystick. Switching between players is incredibly easy, and through screen tapping you can perform a variety of different maneuvers. Games are fast paced and can be very challenging at times due to the new opponent AI. This new AI is not only among the best I’ve seen in a sports game, but at time, actually feels like you’re playing against a human opponent. Thankfully, the AI that controls your teammates is also improved, which not only helps to even the odds, but also can result in some incredibly satisfying goals. Your teammates even go as far as to get in proper passing positions while maintaining proper field position. This makes the game feel like you’re actually playing with a team instead of just cycling through available players to control like way too many sports games. Since the AI is a force to be reckoned with, you might want to spend some time in the game’s extensive practice mode. You’ll be able to hone all your shots which not only will help you in single player, but is practically required to do well in the online multiplayer mode against actual real opponents. Matches are made via Game Center, and so far it seems like there’s a decent online playerbase as I haven’t had any difficulty finding people to play with. Games are smooth,and I’ve rarely encountered even minimal lag. First Touch Soccer has tons of content. There are over 250 club teams, 30 competitions, and 7 different game modes. My favorite game mode is “Dream Team" mode where you play games to win coins which are then used to hire all of your favorite players to create a legendary team. You can even customize your team’s uniforms along with practically everything else you’d ever want to tweak. The graphics in First Touch Soccer are amazing. Character models are great, and the in-game camera does a great job of focusing on all of the action without ever getting in the way. There’s even a full instant replay system that gives you complete control of the camera and even allows for YouTube uploads within the game. It’s really cool, and perfect for bragging about insane plays you made during a game. At this point in the life cycle of the App Store there are a ton of different soccer games available, but First Touch Soccer is both the latest and greatest. Even if you’ve got an existing favorite soccer game, First Touch Soccer is worth downloading because of the improved AI alone. It makes playing the game feel like actually playing a real game of soccer, with real players, which is an incredible achievement for a mobile game. Online multiplayer is the proverbial cherry on top of numerous other great features, making First Touch Soccer an effortless recommendation.